I know! I look like a total creeper. There is an inside joke to that picture. 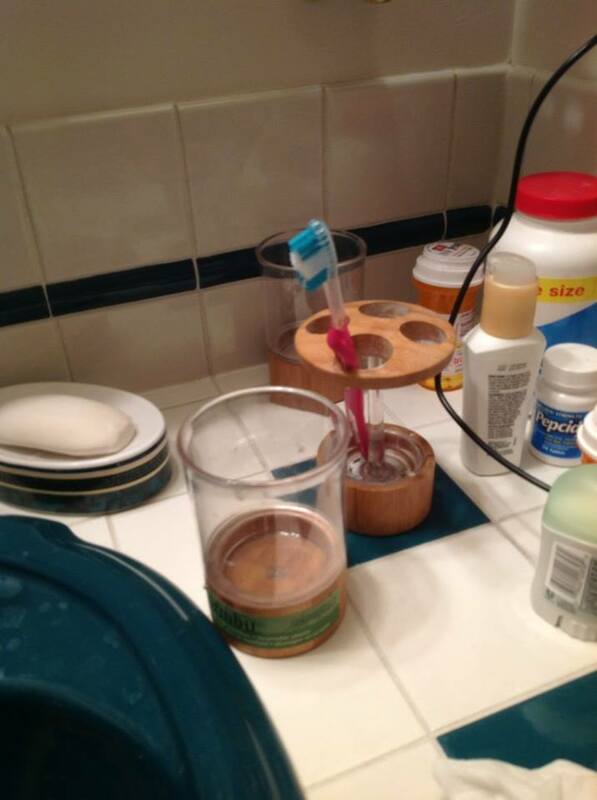 And yes, it is actually Jane Yolen’s toothbrush. And her amazing daughter, Heidi, encouraged me to post it. See, Jane is human and has to brush her teeth too. I just returned from my dream. Except, my dream was real. It involved talking, studying, and learning about picture books with one of my favorite and most admired authors, with a small group of lesser known, but just as amazing people.–wow, that’s a long sentence! In my dream I was invited to stay at this author’s home, eat all my meals with her, and even most importantly, read her books (which included a library which would make any small town library envious.) On the first day we were handed a folder with an index of where we could find books by genre. The library even extends to the bathrooms. The books in my room. Mine had the smallest library. 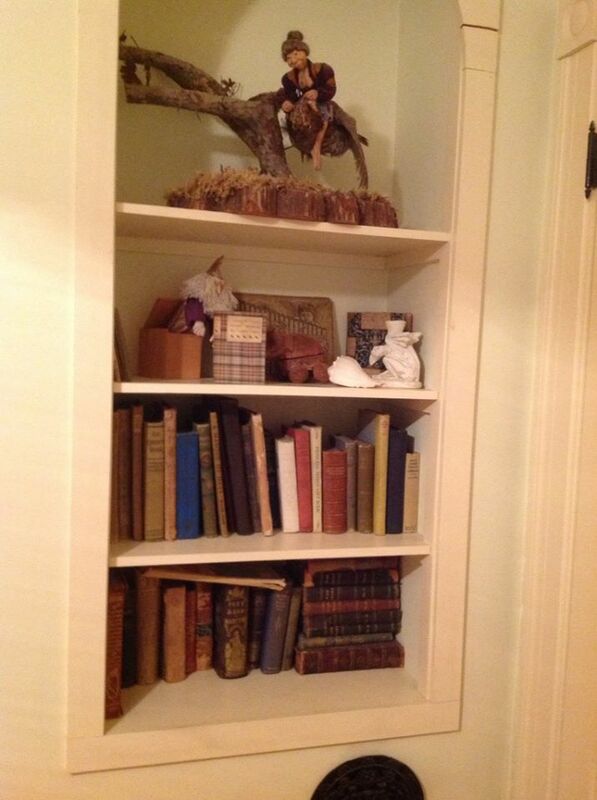 But I also had antique books. Grounding myself was hard. This was like meeting Emily Dickenson, and in so many ways, Jane is Uncle Emily. She is an owl, wise and giving. When you hear her voice, you stop and listen. I never spent as much time listening as I did those last four days. This weekend was filled with daily lectures, storytelling, storytime, poetry, writing and critiquing, rewriting, validation, art, guest speakers, amazing food and friendship. 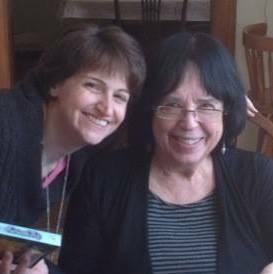 When given access to someone as knowledgeable as Jane Yolen, you can only expect to learn. And learn we did! Jane gave us access to her house, her personal library, her books, her dishes, her daughter (who is of course all grown up). No room in the house was closed off, though I didn’t go into her bedroom–though there were books in there. We became part of the family for the weekend, and created our own camaraderie for a lifetime. What did I learn, you ask? So much! Which I will be sharing over the next few weeks. It is too much to cram into one blog. But Jane was so giving of herself and her knowledge, that it would not behoove me to keep it to myself. I’m going to start with the one thing I learned that I wasn’t expecting to learn. It is not a new lesson by any means, but it is the most important one. It is the reason Jane Yolen has published over 300 books. Are you ready? Jane works hard. She works every day. She continues to grow as a writer. She continues to find challenges. She’s not afraid to take risks. The word FLEXIBLE was used often. Jane is not where she is because she is an amazing writer. There are many people who are amazing writers. She is there because she’s never given up. I’ve come back from the weekend with a plan. No more writing when I can find time. Writing is now part of my day. I cleared off my desk so I have a place to storyboard and track what projects I’m working on, and I have a validation that I am heading down the road I want. I grew as an author, and as a person. I’m home now. And though I now have to cook, do laundry, and get back to daily life I’m still in my dream. I’m already more productive this week then I was last month. And as soon as I hit publish, I’m back to working on a new manuscript I started yesterday, and editing another one from critiques from the weekend to submit. If you want something, work for it. You’ll appreciate it so much more. 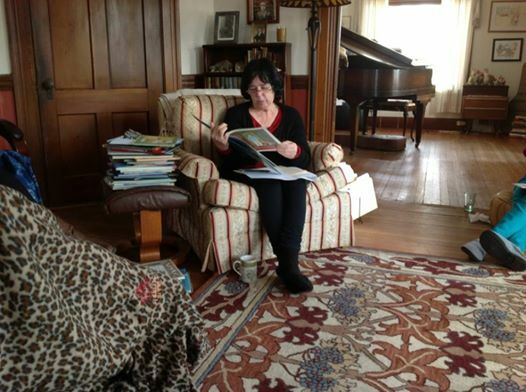 And thank you to Jane Yolen and her fabulous daughter, Heidi Stemple, for opening their home.